Come out and have some fun with your fellow elks. 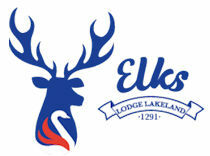 Our Lakeland Elks Golf League plays each Thursday. It’s a fun and easy evening and it’s Happy Hour on Thursdays! Click on any button above to see the Weekly Standings of each Division . Great job this season. We had some interesting results for the season. Next Dart Season (Season 26) will start in August. Anybody can play and we hope to have more teams in the Fall. We are finally all set for Thursday. I want to thank everyone for a great season. There was excitement and competition right down to the final week of the season in each division. Regardless of how you finished, we hope you had a great time and will be back for our summer/fall league. Again, thanks to all for your support of our league and the lodge. We hope to see everyone here this Thursday to root for (or against) our remaining contenders as they vie for a spot on our wall. Match 1 – Tina & Dave vs. Julie & Tom on board 2. Match 2 – Alice & Mel vs. Sherree & Bruce on board 3. Match 1 – Donny & Leroy vs. Rick & Keith on board 1. Match 2 – Chris & Randall vs. Tom & Greg on board 4. Match 1 – Carmen & Jack vs. Vickie & Kyle on 1st available board. Match 2 – John & Phil vs. Mac & Dennis on 2nd available board. I was wanting to see how many of you would like to participate in a Thursday evening fun dart night after the season ends next week. Dates TBD. Good chance to come out and keep Thursday night going at the Lodge. First timers get a chance to play and everyone gets to Practice their skills. Want to meet some new people and players. Get ready for next season. I’m Thinking Blind draw with $5 entrée fee with statistic for the night just for fun. I have talked with some Volunteers to help with this like JC, Mac and Christine W. and want to thank them up front as I will not be able to stay late to see the finished most nights. Please let us know so we can make plans on what we will be doing. Where has this season gone? We are in our final week for tons and high ins and outs! Good luck to everyone. Our banquet is April 25th and it is time to let me know if you need an extra dinner and if you want chicken. If I don’t hear from you, we will have a juicy steak for you. PLEASE, reply to only ME for additional meals for a cost of $12.00 each and your request for a chicken meal. P!ease do not tell me if you need any of this, email me, text me or give a hand written more cause I will probably be having a cocktail next time you see me!! Again, good luck to everyone and thanks for another great season! Last Week coming up for all the darters and High in and outs. Good Luck. Great season guys looking forward to the playoff!! Remember to get your dues paid so you can finish the games, April 1 the old cards will not work anymore. I have some sad news for our darters. Jim and Jibby will have to withdraw from the rest of the dart season. We were informed yesterday by message from Shannon. Medical reason that I am not at liberty to say. Play team 25 will have 3 wins added to their standing as a forfeit. Any All Star Points that were accumulated for teams in the 9th and 10th weeks will be removed from the stats. Jibby will retain her high in for the first game of 133 (week 6) until a higher number is recorded. They have paid all the dues required. We feel this is a fair and just solution and apologize for any inconvenience that this might have caused and thank you in advance for your support of this decision. Team 21 is scheduled to play Jim and Jibby this week and it will be considered a forfeit. So Board 1 and 4 will be open at the 6:30 slot if anyone would like to move into those slots.